Adrenals are the little organs above your kidneys that effect hormonal imbalance. The adrenal glands are controlled by the hypothalamus, which also controls the ovaries and thyroid. 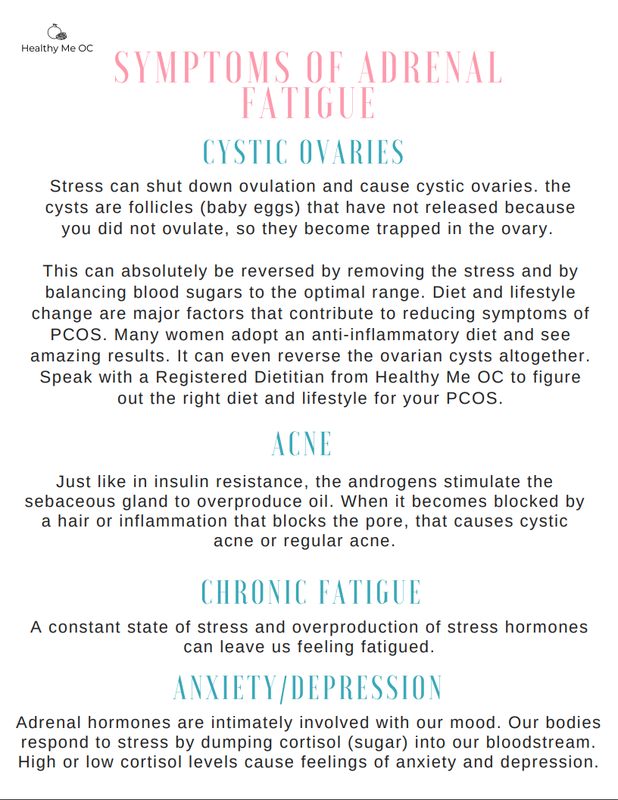 How does stress effect PCOS? High levels of stress over a long period of time makes our adrenal glands send signals to the hypothalamus, telling it to turn off ovulation. Extreme stress will translate in our bodies as "not a good time to bring a baby into the world." Part of the adrenal gland produces DHEA-S, which is similar to testosterone. It causes facial hair and acne as well. DHEA-S is the best measure of adrenal stimulation. 1. overexercising- you may be hanging on to high intensity exercise because you feel like your weight is spiraling out of control, however you need to let go of that to heal adrenal fatigue. The most comprehensive way to test adrenal hormones is by taking a DUTCH Comprehensive test. Speak with a Registered Dietitian, who can provide this test for you and interpret your results. When managing PCOS, there are multiple symptoms that may occur, because there are multiple causes for having PCOS. Some symptoms include facial hair, hair loss, acne, mood swings, or weight gain. It is important to take an individual approach. There is no one cause or cure. You may need a completely different treatment plan than another woman. Consider speaking with a registered dietitian for direction on how to treat your symptoms.